When we're talking about Arthur Conan Doyle's contribution to literature, we really mean the entire oeuvre of fifty-six Sherlock Holmes stories, plus four Holmes novels. But if you're looking for an introduction to the famous works, The Adventures is a good choice, as it presents Doyle's detective character fully fledged—and includes some of his most intriguing mysteries. At this point in the canon, Holmes had already appeared in two novels, starting with A Study in Scarlet, in which Dr. Watson first meets Holmes but which features the detective for less than half the story. The Sign of Four develops Holmes's persona and surroundings further. The Adventures of Sherlock Holmes then gets right down to it, with its 12 short stories pitting the sleuth and his narrating sidekick against some of his best puzzles and cleverest enemies. 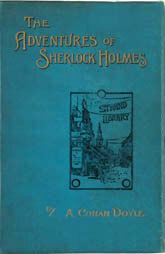 Chances are, however, you won't easily find this particular volume but will more likely lay your hands on a collection of Sherlockiana that includes several stories from The Adventures of Sherlock Holmes along with some from later volumes, namely The Memoirs of Sherlock Holmes, The Return of Sherlock Holmes. and The Case Book of Sherlock Holmes. Which isn't necessarily a bad thing, because there are great Holmes entries in each of these volumes. Better yet, pick up a complete works (they're cheap enough now) and delve into them at will. Most of the stories appeared in The Strand Magazine in London before being collected into book volumes. They do follow some kind of chronology—though "Watson" jumps around a bit with the order, which gives Holmes fanatics (whose numbers are legion) the job of figuring out when in real time each of the fictions is thought to have taken place. But it isn't at all required to read the stories as given in order to appreciate them. However, two of the most popular—and my favourite—Holmes tales lead off The Adventures of Sherlock Holmes. "The Red-Headed League" is a real head-scratcher with one of Doyle's clever solutions that seem obvious after they are revealed—an irony that Doyle has Holmes himself point out in many a story. All the rest in this volume are worthy, though another story that seems particularly popular for movie and TV adaptation is "The Adventure of the Speckled Band" which involves a...but if I tell you, you'll know the solution to the mystery. Ditto for "The Adventure of the Blue Carbuncle". These stories are individually ingenious as mysteries but also interesting, taken as a whole, for detailing the odd relationship between the arrogant, reclusive Holmes and the affable doctor, the purported chronicler of these cases. Watson, by the way, is never told by Holmes that any piece of detection is "Elementary, my dear Watson." At least not in the books. Those words are stitched together by the movies. One phrase the movies do get right from the books, though, is Holmes's call to action: "The game is afoot". However, sorry to disappoint Sherlockians but the words are not original with Arthur Conan Doyle. His detective is actually quoting Shakespeare, from Henry IV, Part 1, to be precise. You do want to get your data acurate when you're dealing with Sherlock Holmes.